Last week, a Twitter handle named @Greenlightcap tweeted about Herbalife and the recent drama going on between finance behemoths Carl Icahn and Bill Ackman. 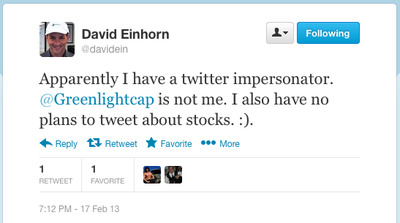 However, this Twitter handle is not associated with Greenlight Capital, the hedge fund run by David Einhorn. Einhorn tweets extremely infrequently. Business Insider first learned about his Twitter handle last July when he was tweeting from the World Series Of Poker, where he was a competitor. Indeed, his last tweet was on July 5, when he suggested his next tweet wouldn’t be until the next poker tourney.